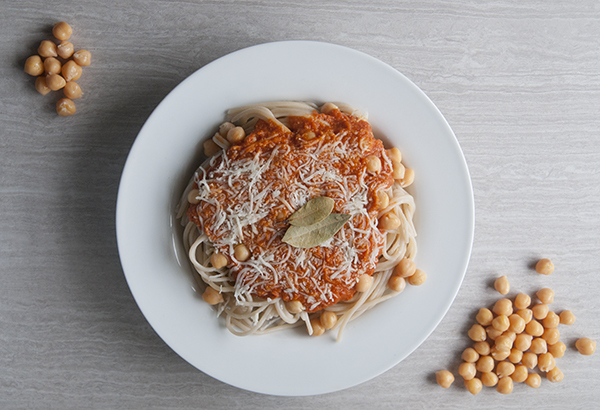 Pasta with chickpeas is a hearty, protein packed vegetarian pasta recipe. Satisfying and simple, this budget friendly dish fills you up without any meat at all. Pasta with chickpeas. This recipe brings me back. My Italian grandmother used to make something similar with white beans. The sauce was creamy and comforting. Just like this chickpea sauce. It is perfect for cool spring days like the ones we’ve been having lately. This pasta with chickpeas almost makes up for the fact that the sun hasn’t graced us with its presence in the better part of a week. I’d still like to glimpse the sun sometime soon, but at least it gives me reasons to make comfort food. As comfort food goes, it’s pretty healthy too. The fat in the dish is from olive oil, and the chickpeas are a nice vegetarian source of protein. It makes me feel almost virtuous. It’s that healthy. 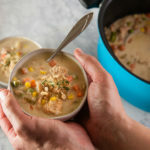 But being the absolute perfect comforting meal it still feels creamy and luxurious without any added heavy cream or gobs and gobs of cheese. Not that I am against cheese gobs. They have their time and place. Plus it’s an easy meal that comes together in about 30 minutes, making it perfect for busy weeknights. Also, if you omit the sherry, it’s very budget friendly. And, have I mentioned? It’s really yummy. I could seriously take a cue from my Goose and faceplant directly into a plate of this night after night and be very happy. Speaking of my Goose, I’m not the only one in this house that could eat pasta with chickpeas day after day. She loves all things with chickpeas including hummus and actually gobbles this up. I don’t know why this surprises me given that one of her go to foods is broccoli, but still. It makes me feel a lot better about letting her eat 3 brown butter oatmeal cookies for breakfast the other day. I see it as a win and with parenting, I take what I can get. 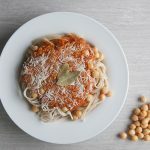 Pasta with chickpeas is a hearty, protein packed vegetarian pasta recipe. Satisfying and simple. Heat a large skillet with a tablespoon of olive oil over medium to medium high heat. Chop the onion and saute the onion in the oil until soft, about 5-7 minutes. Season with salt and pepper to taste. Add sherry, 1 can of the chickpeas and minced garlic to the pot with the onions. Simmer until the sherry reduces down by half, approximately 6 minutes. Remove from heat. Pour the mixture into a blender or food processor along with the tomato puree. Blend or process to a creamy consistency. Pour mixture back into pan and turn heat to medium low. Add the bay leaves, Parmesan cheese, and the rest of the chickpeas. Let simmer for an additional 10 minutes, stirring occasionally. *I use gluten free pasta. My favorite is brown rice or quinoa pasta. Feel free to use regular pasta in place though. This is one of the recipe gems that tastes even better the next day, so if you are feeding a crowd, double the recipe and have left overs! I do eat meat but not a lot of it so I eat a lot of vegetarian proteins. Give this a try. The chickpeas add the protein and add a really flavorful nuttiness to the sauce. Yum. Thanks for visiting! I’m definitely comfortably full after a plate of this dish. Hope you try it! Thanks for visiting! Super easy and very good! I hope you give it a try! Thanks for stopping by! This recipe is actually a pretty traditional Italian recipe. I believe it’s called pasta e ceci and originates from rustic Tuscan cuisine. My Italian grandma (who wasn’t from that area but further south) made a take on it with white beans. It’s really yummy! I hope you give it a try sometime! Thanks for visiting! 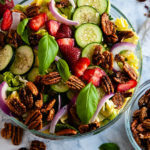 Love that it’s not loaded with cheese and so much more healthier. Love chickpeas so pinned it for later. Don’t get me wrong- cheese is delicious! 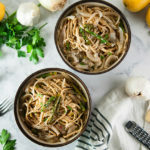 But this way you can eat that pasta guilt free and it is so yummy! Thanks for stopping by! Wow. That sounds interesting. I don’t usually think of doing chickpeas with pasta, so I will have to try it out. 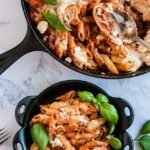 It’s one of my favorite pasta dishes these days! I love it. The chickpeas blended in the sauce make it really creamy and it’s filling without being really heavy.